Continue reading From Inclusion Daily Express. Continue reading Access Board Issues New Guidelines for Accessible Design. Some may choose to do a literature review and submit a bibliography on travel & disability. Continue reading Access Board to Publish ADA and ABA Accessibility Guidelines. Continue reading Smithsonian Project on Disability. Candy Harrington, author of "Barrier Free Travel: A Nuts And Bolts Guide For Wheelers And Slow Walkers" shares this insight on best practices in the travel industry. Households headed by a person age 55 to 64 spend 52% more than the national average on hotel and motels according to the Bureau of Labor Statistics, Consumer Expenditure Survey. between 1995 and 2050, according to the Census Bureau. The Center for International Rehabilitation provides information that is indirectly useful to those traveling with disabilities or pursuing inclusive destination devlopment. Continue reading Special Issue of Prose Studies: Disability and/in Prose. 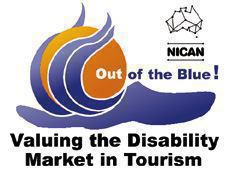 Registration materials are being circulated for the 5th National NICAN Conference on travel and disability in Perth, Australia. Scott Rains will speak the morning of the final day of the conference - September 22 at 9:15. Continue reading Inclusive Travel Conference - Australia.